Paul M.F. Cheng is Chairman of The Link Management Limited which manages a portfolio of previously government-owned retail and car parking assets valued at over HK$30 billion. The privatisation in late November, 2005 was the world’s largest Real Estate Investment Trust (REIT) IPO. Mr. Cheng is also an independent non-executive director of Esprit Holdings Limited, Kingboard Chemical Holdings Limited and MFI Furniture Group Plc in the United Kingdom. Mr. Cheng is a member of the Executive Committee of the PRC-based All China Federation of Industry and Commerce and serves as an advisor to the China National Committee for Pacific Economic Co-operation and China Center for Economic Research of the Peking University. In Hong Kong, he is a member of the Chinese University of Hong Kong Council. He is also a Steward of the Hong Kong Jockey Club, a US$10 billion organization which recycles its profit to charity and community projects. The betting duty from this operation is one of the primary sources of Hong Kong Government’s revenue stream. 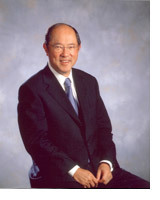 Mr. Cheng has been active both as a corporate leader and in politics. He was formerly Chairman of Inchcape Pacific Limited, a major trading conglomerate employing over 6,000 people throughout Asia, and N.M. Rothschild & Sons (Hong Kong) Ltd. He is a past Chairman of both the American Chamber of Commerce in Hong Kong and the Hong Kong General Chamber of Commerce. He was a member of the Hong Kong Legislative Council prior to 1998 and was also a member of the Preparatory Committee, appointed by the Chinese Government, to prepare for the establishment of the Hong Kong SAR on l July, 1997. Mr. Cheng is a Justice of Peace and was decorated “Chevalier de l’order de la Couronne” by the King of Belgium in 1991. He was made an honorary citizen of Nanjing in Jiangsu Province, China, in September 1994, and was also appointed an Economic Advisor to the city. In 2001, he was inducted into the Beta Gamma Sigma chapter of the Hong Kong University of Science and Technology in recognition of his community service and more recently he was made an Honorary Fellow of the same university for his contribution towards education. Born in China, he was raised in Hong Kong and received his higher education in the United States. He has a B.A. degree from Lake Forest College (Illinois, U.S.A) and received his M.B.A. degree from the Wharton Graduate School of Business at the University of Pennsylvania.